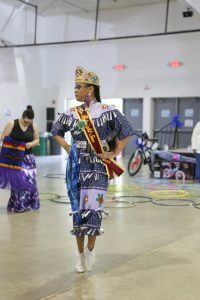 Crystyna Chuitt dances to the beat of the drum at the 10th Annual Tribal Celebration, June 9. Everyone was welcome at the 10th Annual Tribal Celebration. Chickaloon and Knik Tribes hosted 629 attendees at the Palmer State Fairgrounds on June 9. Clear skies, fresh coffee, and plenty of fry bread made for perfect powwow conditions. Perfect is not a word used lightly because powwows are inherently great, but this past Tribal celebration was truly powwow perfection. Celebration organizers worked with 63 vendors so attendees could peruse tables relevant to their interests. Representatives from their respective community organizations and artists interacted with guests. Southcentral Foundation Dental sponsored a visit from Tillie the tooth fairy, with a guest appearance from the Benteh Nuutah Valley Native Primary Care Center’s Nolan the Colon. Activities included hula hoop contests with age brackets from five and under to 80 and up, a beading contest judged by Tribal leaders, and a salmon dip-off. Borough Assemblyman Jim Sykes addressed the crowd regarding the context of the resolution’s passage. “…The recognizing is respect. It’s very simple, and it’s inclusive. [The resolution] recognizes what [went] on in the past. … It was more than a proclamation — it was voted on.” The Borough resolution to recognize the second Monday of each October as Indigenous Peoples’ Day includes specific language recognizing the “deep cultural contribution[s]” of the Ahtna and Dena’ina Athabascan peoples to the Mat-Su region. Sykes closed by encouraging attendees to start organizing now for this year’s Mat-Su area Indigenous Peoples’ Day recognition. This year’s celebration was dedicated to honoring the men of the Tribes. Gary Harrison, Chickaloon Traditional Chief, Albert Harrison, Doug Wade, and Rick Harrison were all presented with traditional beaded knife sheaths. Emcee David Harrison, Southcentral Foundation Tribal Relations specialist, was given a beaded medallion. The Knik Tribal Council President Michael Tucker was gifted an ornate seal skin vest with the Knik Tribe insignia embroidered on the back. Lisa Wade, Chickaloon Tribal member, spoke to the significant community contributions made by the men being honored. Singers and drummers circled a large skin drum seated near the stage; the warm reverberation of their music enveloped everyone in an inclusive invitation to start dancing. Technical difficulties didn’t stop the kid’s dance party — singers and dancers continued to play for the children. Crystyna Chuitt, youth attendee, was on the dance floor for hours. When asked if she had attended previous year’s Tribal celebrations she replied, “Feels like five or six years. I’ve been dancing ever since I was like two, and I just grew up in the drum. So I’ve been coming here ever since then. So however long that is.” Crystyna’s confidence in her cultural expression demonstrates the strength of her community; there is much for Chickaloon and Knik Tribes to celebrate. SCF recognizes that the success of other Native organizations is key to achieving our vision of a Native Community that enjoys physical, mental, emotional and spiritual wellness, and is proud to be walking toward wellness alongside Knik and Chickaloon Tribes. For more information on Tribal events in Sutton, visit lifehouseclinic.com. For events in the Valley, visit the Benteh Nuutah Valley Native Primary Care Center’s Facebook page.